Candy is something that's been around for well...as long as I can remember and even long before that. It can be enjoyed as a snack, treat, or even used as an ingredient so it's pretty darn versatile too. So who wouldn't want to win a nice assortment of Palmer candies? 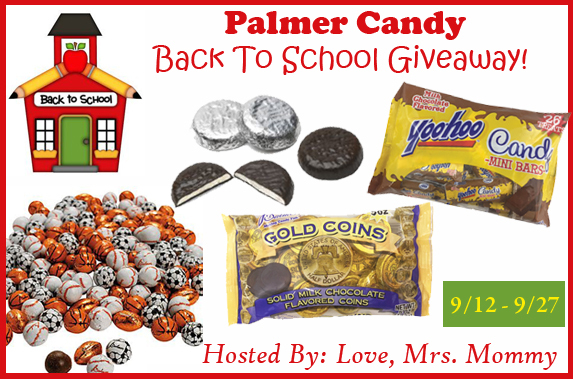 Winner will receive: A variety of Palmer candy shown in the giveaway image! Palmer's products don't just look great; for Palmer, taste and quality are equally important – from creamy, smooth milk chocolate and famous crunchy Double Crisp to delicious filled candies of all shapes. Palmer offers a wide assortment of sweet candy treats for holidays, celebrations and every day enjoyment.